Do you have dreams of a wine cellar, but a shoebox-sized living space? Luckily for you, new wine storage options can help you make the most of small spaces. Small wine cabinets can hold a treasure trove of bottles, even if your abode is closer to a one-bedroom apartment than a castle. If you’re seriously space-challenged, a small wine refrigerator is the way to do. 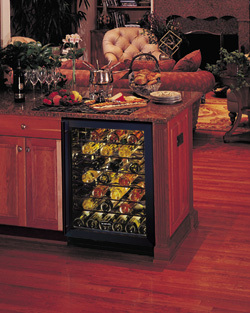 Wine refrigerators like this Marvel model hold 23 bottles in a space only 34 inches high by 15 inches wide. Wine refrigerators can be built right in under a kitchen countertop, so they don’t take up extra space like a stand-alone model would. These wine refrigerators hold the bottles at the correct position and temperature, creating ideal aging conditions. Another option for someone with limited space is a wine credenza. Wine credenzas are meant to fit right in your dining room like a sideboard or regular credenza, but they hold your wine collection. Credenzas can be glass-fronted to show off your collection, or wood-paneled to fit right in with the rest of your furniture. At about 40 inches high and topped with a tabletop, wine credenzas make the perfect place to hold serving platters during the holidays, or bar equipment during a party. Don’t let your small space hamper your big wine-collector dreams. Modern wine storage solutions can work for a space of any size. That’s a gorgeous built-in wine refrigerator! I love how the wood matches the floor. Is that Cherry?